Yesterway: Happy Birthday and Thrifting to Me! Thank goodness I'm back for some new blog posts - as dramatic as it may sound, I was coming close to withdrawal. Work has once again been keeping me quite busy but I have managed some good thrifting and the like. So here is just the beginning of it...dun dun dun! In my absence I've had my birthday! Woohoo! And what does a girl like me get for her birthday? Vintage goodies of course!...okay, and some clothes too. As my parents are divorced, I'll start with the stuff I received from my mum first. Pretty neato huh? Thank you mum! Anywho, pictured is a small blue Pyrex primary mixing bowl. This was part of an older set as it as the simpler makers mark on the bottom and the thicker glass. Below that is another of the neat little single serving clear casseroles/refrigerator dishes. On the bottom is a Verde divided casserole. 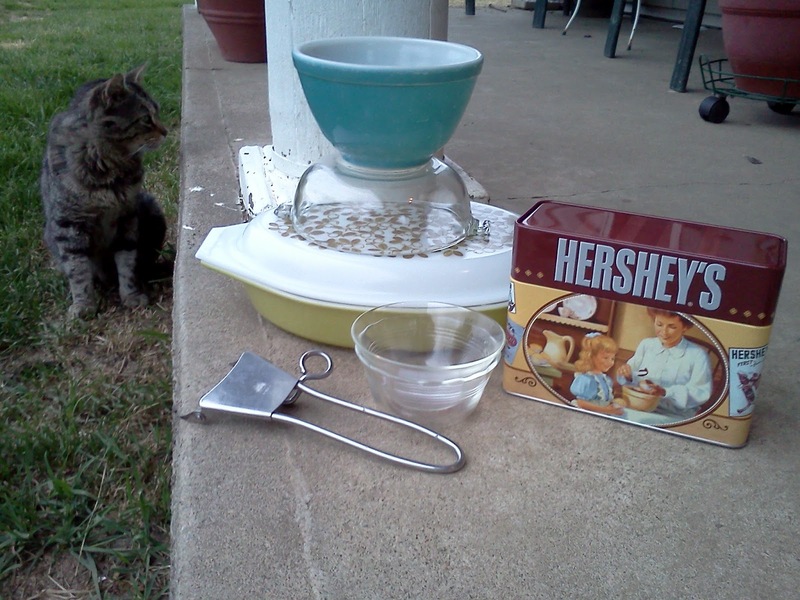 Finally, there are two matching custard cups, flameware handle, and adorable (although new) Hershey's recipe box with cards. I don't know how he did it, but once again he found a Pyrex casserole with the serving caddy. I initially believed this dish was from the 1970's but after looking at the stamp, I'm actually now leaning towards the 1950's or 60's perhaps. The funny thing about this casserole, is that I can find no information on this casserole anywhere. In fact, I could only find it pictured in a single listing on EBay...aside from that, nada. If you have any further information on this casserole, please let me know. 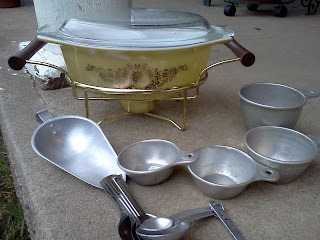 Also, he found the cute little aluminum scoop and my step-mother found the dry measuring cup set as well as two sets of measuring spoons. I also continued my dinnerware luck finding a pink dinner plate and saucer, as well as a grey luncheon plate. 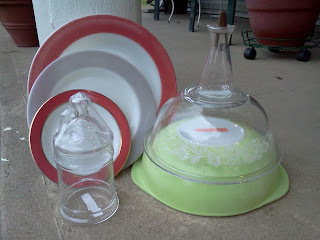 Also, I found another lime casserole dish, clear Colonial Mist mixing bowl, and Woodland salt or pepper shaker. Last was a apothecary style jar that matched another I had previously found. I intend to use these in the bathroom for storage...much cuter than original packaging Q-tips come in. 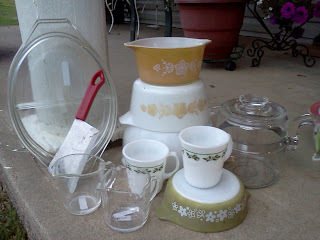 Oh my, between gifts and thrifting you have been a very lucky lady lately!